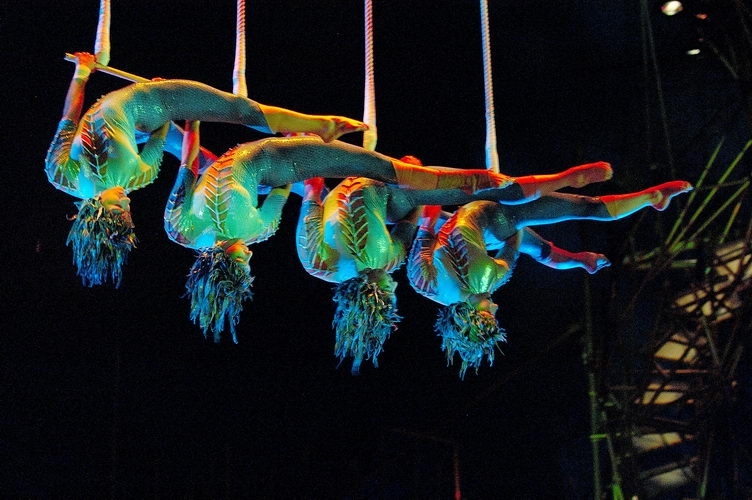 From their trapeze on high, four young women perform a series of striking acrobatic moves, displaying grace, sensuality and impeccable timing. Once again, Icarus and The Promise have a chance to clasp hands, and once again the Gods revolt. Or rather this time, it’s the Goddesses who revolt. Are they as jealous of The Promise as the Limping Angel is jealous of Icarus? Or are they doing the Limping Angel’s dirty work? 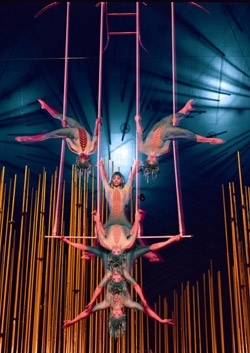 Four goddesses perched above the audience, suspended within a crystalline cage. Their every movement beckons. Their every gesture an enticement to Icarus: a promise of what awaits. But he’s been burned before. The Goddesses descend swiftly and, with the help of some underworld figures, they bind The Promise's feet and draw her up into the mouth of heaven. 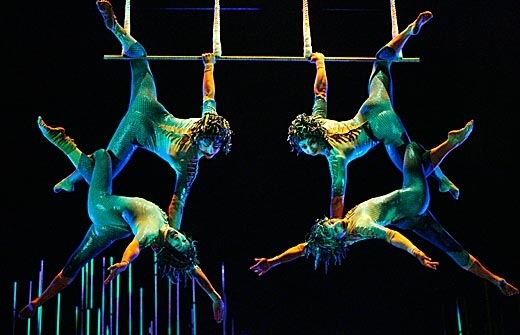 Icarus is left despondent once again, and he’s forced to watch as the Goddesses perform their aerial wonders. They’re taunting him: say goodbye to your love, Icarus. Say goodbye to your dreams of one day reaching the heavens. 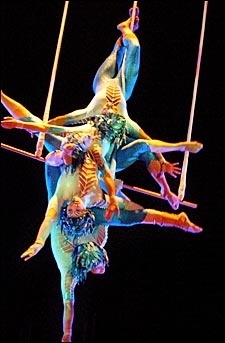 The Triple Trapeze is a wide, static (non moving) trapeze suspended from the ceiling by four ropes. Four spidery-dressed females, spin, gyrate and roll with their amazing grace and attention to detail.